Since I missed last weeks BTT I'm going to answer it as well. Just keep scrolling if you want to see my answers. Do you ever read books that could be considered patriotic? Rousing stories of heroes? History? Brave countrymen & women doing bold things? What would you recommend if somebody asked you for something patriotic–no matter what your country? First off let me just wish all my fellow Americans a Happy 4th Of July!! Do I ever read books that could be considered patriotic? In short yes, I do. However, I don't really read them enough to recommend any. Unless of course you like books filled with random Historical facts then I could recommend a dozen or so. So my Patriotic recommendations this week will come in the form of TV miniseries and Film. Some of the choices will be based more in fact than others but if you're wanting to feel Patriotic then these are the films you should check out. 1. 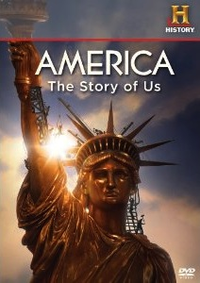 America:The Story Of US- This was a 2010 Miniseries developed by the History Channel and it was simply put amazing. Our whole family watched it and even the kids were glued to the screen. If you want to learn a little bit about American History without reading a book filled with facts then this is the miniseries for you! Into The West was a 2005 Miniseries that aired on TNT and was produced by Steven Spielberg. Not only was the acting superb but the set design and writing was fantastic as well. This story was unique because it followed both the white settlers side of the story but also the Indians as well. While I wouldn't call Into The West 100% historically accurate it is a great miniseries that everyone whether American or not should watch at least once. 3. 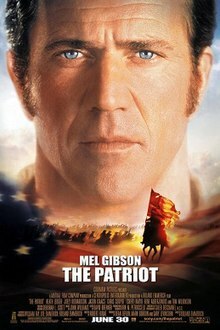 The Patriot- OK, OK, I know this is a Mel Gibson film and blends both fact and fiction to create the story but this couldn't be a complete list without mentioning this film. I mean hello Mel Gibson impales a red coat with an American Flag in only a way Mel Gibson can pull off without looking like a psycho. If that doesn't stir your patriotic senses than I don't know what to tell you. 4. 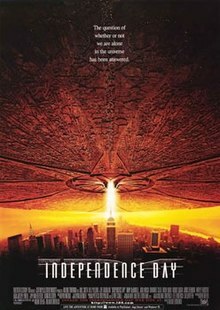 Independence Day- Sure this film has Will Smith trying to stop an Alien Invasion but it also includes one of the most Patriotic speeches ever. I want to grab my flag and wave it around in the air every single time I hear it. I was going to link the youtube video but in case some of you haven't seen the film I didn't want to ruin the build up for you so instead I'll just post the speech. "Good morning. Good morning. In less than an hour, aircraft from here will join others from around the world, and you will be launching the largest aerial battle in the history of mankind. Mankind, that word should have new meaning for all of us today. We can't be consumed by our petty differences any more. We will be united in our common interest. Perhaps it's fate that today is the 4th of July, and you will once again be fighting for our freedom. Not from tyranny, oppression, or persecution, but from annihilation. We're fighting for our right to live, to exist, and should we win the day, the 4th of July will no longer be known as an American holiday, but as the day when the world declared in one voice, 'We will not go quietly into the night! We will not vanish without a fight! We're going to live on, we're going to survive.' Today we celebrate our independence day!" 5. Band Of Brothers- This 2010 Miniseries is one of the best I've seen that deals with American Soldiers during WWII. Blending facts with fiction this sweeping 10 part miniseries is one of the best ever created. I was tempted to put Saving Private Ryan on the list but ultimately went with Band Of Brothers since I like it just a bit more. However, you should totally check out Saving Private Ryan if you haven't already. Oh and if you'd rather not spend 11 hours watching this miniseries you can buy the book by Stephen E. Ambrose instead. Here's a couple other recommendations in case you've seen those listed above: How Booze Built America, Forrest Gump, Roots, Yankee Doodle Dandy, Gone With The Wind, The American Revolution Miniseries, Top Gun and The Men Who Built America miniseries. What’s the worst thing you ever did to your reading material? Sand in the bindings from the beach? Dropped into the pool? Covers smeared with sunscreen? While I've always tried to treat my books with utmost care I'd be lying if I said I've never damaged one. I've spilled coffee on books, dropped in the toilet, dropped in the tub, had books damaged by flood, dropped a meatball sub on one, used books to kill spiders, used books to level tables..... well you get the point. What will you be doing for the 4th? What are some of your favorite Patriotic books or films? Have you seen any of the films mentioned above? 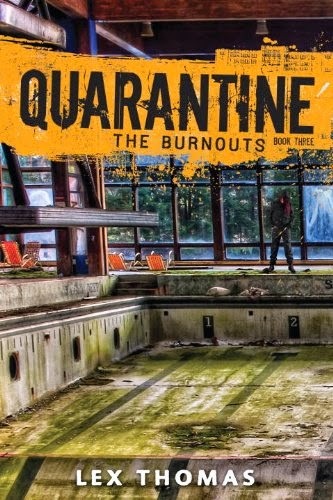 What's the worst thing you've done to a book whether intentionally or not? Want to check out last weeks post where I discussed Nightmare casting choices? Click Here!